A review of "Behind the Bow" by Blair Peterson. I will always take the opportunity to ask prominent archers if they recommend any books, so knowing GRIV has a large library, asked him after his Seminar what came to mind on recommended tomes. Understanding Winning Archery by Al Henderson, which I have had for years and is pretty damn good. You can find it in quite a few archery shops with a quick google. It's a classic. The other one he recommended I'd never heard of before. "Behind the bow" by Blair A Peterson. Some quick googling located one in the USA and one in NSW. Hilariously, the USA one was cheaper. It was published in 1977, so is a look back at the bows, releases, and most importantly, fashion and hairstyles of the times. Eva Troncoso features every now and then. She's lookin' pretty fine in this photo and I reckon she's using a super chicken release..
One of the interesting things about having archery books across a wide range of publication dates is seeing how they differ in recommendations. In the simplest form, they all relate to nocking an arrow on a string, pulling back and releasing. What everyone thinks is important about that tends to vary to a reasonable degree. Blair goes over the basics that we're all familiar with and then concentrates on the part of bringing it all together. In my reasonable collection of books, I haven't seen anyone cover the various aspects of what needs to be committed to automatic pilot and what needs to have total focus 100 percent of the time. He also covers mental discipline in terms of scenarios of what might and absolutely DOES happen when an archer goes to a competition. Blair breaks down the aspects of practice into what is now recognised as the basic principle of dedicated practice. A nice touch is that towards the end of the book is Chapter 13 where a quick list of the overall effort is summarised in two pages with the major points given a few lines each. Just enough to remind you of all the information contained in the previous 12 Chapters. Chapter 13 covers the Compound Bow, still being relatively new. 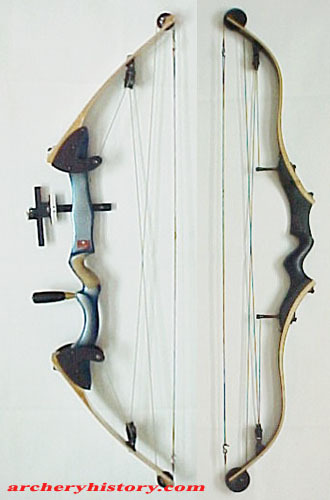 A bow very similar to what is being used can be found at archery history. The one on the left is a Carroll Target Compound which Blair is using in most photos. It's not the exact same model but the only visible difference is closed in cable anchors at the limb pockets where Blair's has cutouts. Note the handy hooks for keeping the string on the ends of the cables. So overall, this is a book which is totally relevant today and it contains a lot of valuable information. If you can find one, I recommend adding one to your collection. As a small postscript, I tend to investigate things casually for the hell of it. I wondered if Blair was still shooting, so some various extra search terms revealed that there was a Blair Peterson who is President of The Villages Archery Club in Florida. What are the chances of it being him? Thanks you for your email and for contacting me about my book. Thanks you also for your kind thoughts about my writings in "Behind the Bow". Few people today have ever heard of or read my book, so it was nice to hear from someone who was familiar with the work. I still am an active shooter and for my age, 71 year old, I still shoot very well. I have tried to follow my own teachings and concepts of shooting and they have served me well over the years. Since writing "Behind the Bow" is the mid 1970s, I have learned a lot more about the mental discipline of shooting, which I have always believed was the true key to great shooting. Many "shooting forms" have produced great shooter but all of them have had one common core...the ability to maintian an absolute central focus (aiming) and the mental discipline to stay in that focus. Subsequent writings, like "With Winning in Mind" by Lanny Bassham, have done a wonderful job of explaining the mental side of shooting. My own experience in over 60 years of archery and my education (Ph.D.) have taught me that if you can control your mental game, you can do well in any shooting sport...or most any endeavor in life. Thanks again for your email and tell George thanks for his recommendation...I have followed his success over the years.